Dr Bike 15 minute free bicycle check up for University of Cambridge Eddington residents, run by Outspoken Cycles. 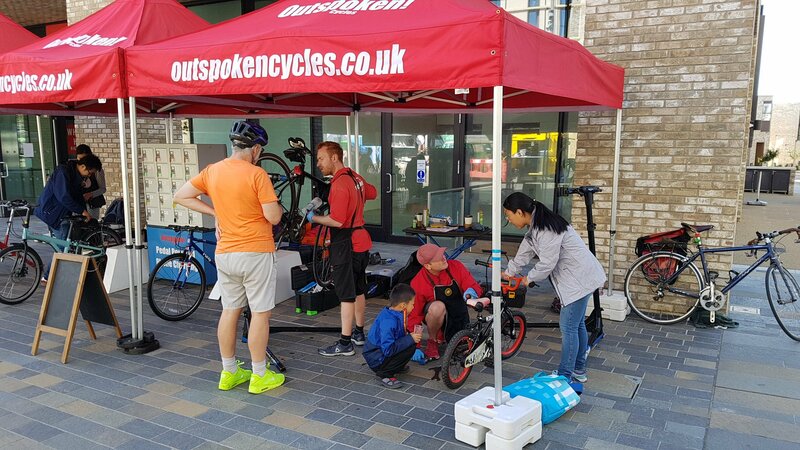 Book a slot and bring your bike for one of our mechanics to check and repair. We do a 35-point safety check on your bike, fix any smaller issues and recommend work for any bigger problems. All labour is free but there is a small charge for any parts. During your slot you’re encouraged to stay and ask questions and pick up tips during the 15 minutes. Alternatively, you can leave the bike with us and collect at the end of your slot. Please note, the session finishes at 7pm and any bikes not collected will be left at the Dr Bike location. We will be at the Market Square under a red gazebo.